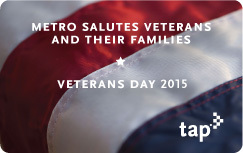 Metro will run regular bus and train service on Veterans Day, Wednesday, November 11, with the exception of a few bus detours for the annual Veterans Day parade in the Hollywood area. Metro would also like to offer a big thank you to those who have served and those currently serving in the United States military. If you’re traveling through Union Station or Patsaouras Bus Plaza on Veterans Day, make sure to glance towards Metro Headquarters — we’ll be lighting the building green as part of Greenlight A Vet, a campaign to establish visible national support for our veterans. Share your photos of the green-lit One Gateway Plaza with us by tagging us on Twitter or Instagram @metrolosangeles!